From the vast void, the infinity, the universe developed into a state of Tai Chi, the supreme ultimate. It is like an immense ball comprised of two opposite and complementary halves, yin and yang. The main purpose of this is for Dan Tian awareness. Dan Tian is the area approximately three fingerbreadths from the naval. It is the centre of Qi. Q2A: Slowly bring your hands up, palms facing each other, breathing in. Q2B: Bring hands towards chest, bending knees slightly. This is the working of yin and yang. Closing is yin and opening is yang. The purpose of this exercise is for breathing awareness. Breathing is the centre of all qigong exercise. The ancient Chinese believed breath is life and life is energy. Q3A: From the previous posture, breathe in, open hands to shoulder width. If your knees feel tired, gently straighten them. Q3B: Breathe out, pushing hands towards each other as close as possible without touching. Gently bend your knees if you have straightened them in the previous move. Continue opening and closing hands several times. Complete the exercise by stretching your hands forward, return to the previous position and straighten your knees. Do this exercise three or less times to start with and then more as you are get stronger. As you breathe in and out, imagine there is a gentle magnetic force between your palms. Pull against this resistance as you breathe in and push against it as you breathe out. Using the same imagery let air go through to the abdomen, except when breathing in the upper part of abdomen (where the stomach is) expands, and lower abdomen contracts. When breathing out (which is often faster when delivering force) the upper abdomen flattens and the lower abdomen extending outward. This is a more advanced method often adapted by Chen stylists. This method allows the Qi to sink to the Dan tian quickly and powerfully when delivering force which is more prevalent in Chen style. Chen style is not a suitable style to start with by people with arthritis … might be later when you are stronger. This is for Qi awareness. It helps to circulate and cultivate your life energy. Q2A : Slowly bring your hands up, breathing in. Q4B:Bring your hands up along your chest and breath in. Continue moving in the loop, standing up as you breathe in and bending down as you breathe out. Finish off after doing the exercise three times. When you breathe in, visualise your Qi moving up to the middle of your chest. When you breathe out visualise your Qi moving down to the Dan Tian. It doesn’t matter if you don’t understand what Qi is. Simply think about this area as you breathe in and out. 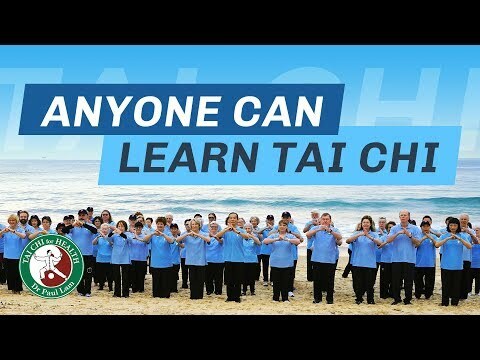 As your Tai Chi improves, you will be able to understand and feel the Qi. While the sensation of Qi is different to different people, for most, it feels like a warm and slightly heavy sensation.